2016 is officially OVER! ;( Okay, I guess there’s still kind of one day left, but still. I can’t believe the year is over already! Everything has been going by wayyyy too fast. This year was amazing though. I read 101 (101!) 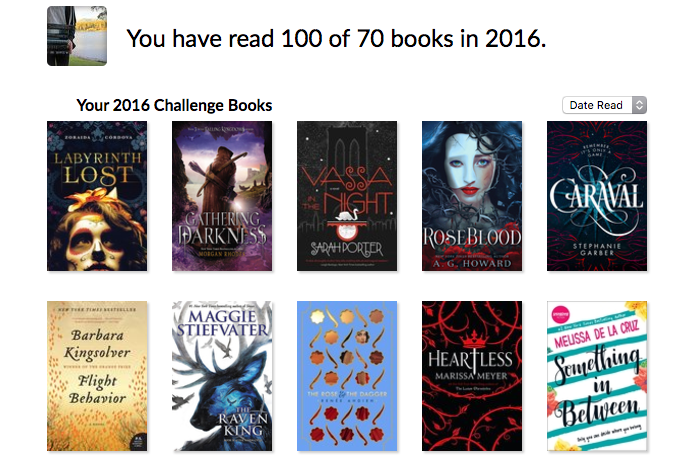 books in 2016, started this blog, and hit 1k on bookstagram! Talk about amazing in just about every single way. 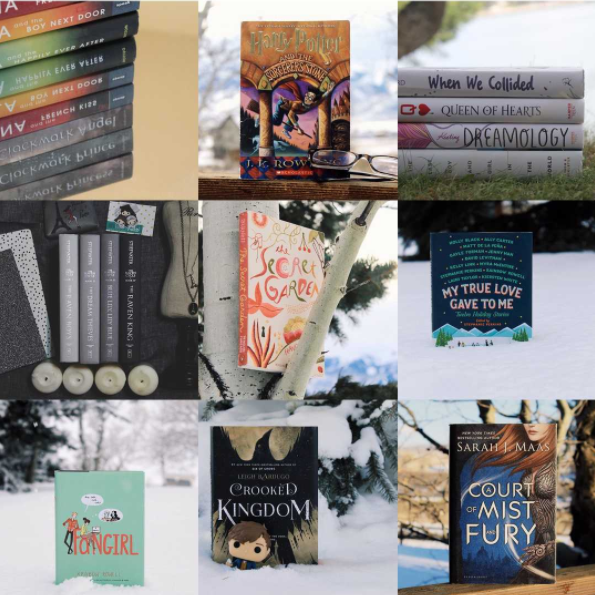 So, I’m going to be sharing all the highlights of my year, including all the books in 2016 (there’s a lot, I’ll tell you that), my top posts on this blog, favorites throughout the year, and more. Seriously, I had a great year this year, and I can’t wait to see what the new year brings for me and for this blog! I read a total of eight books in January and eleven in February (some not pictured). Anna and the French Kiss, Lola and the Boy Next Door, Isla and the Happily Ever, all three by Stephanie Perkins, and The Heir by Kiera Cass were all rereads. Twelve Angry Men by Reginald Rose was for school. 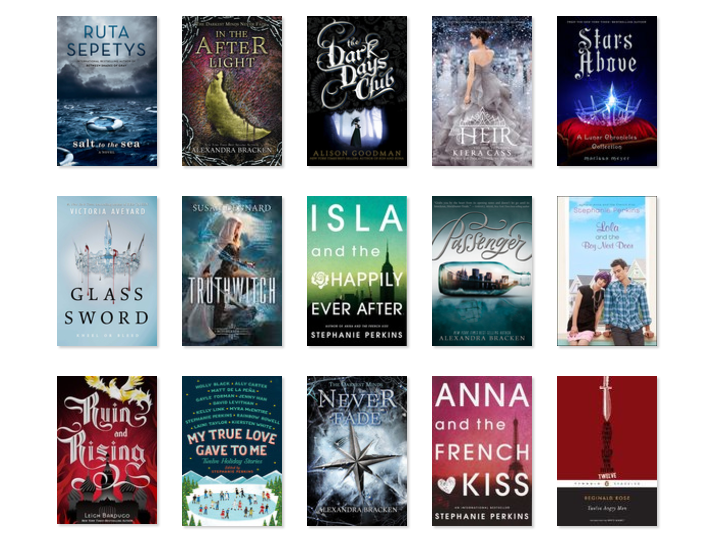 My favorite in January was Passenger by Alexandra Bracken while my favorite in February was Salt to the Sea by Ruta Sepetys. To make a total of eleven books, the first four were read in February. In March I read twelve books (some not pictured). Clockwork Angel, Clockwork Prince, and Clockwork Princess, all by Cassandra Clare were all rereads. My favorite read from February out of these four was A Court of Thorns and Roses by Sarah J. Maas and my favorite book in March was Lady Midnight by Cassandra Clare. One of the books pictured (Harry Potter and the Order of the Phoenix) was read in March. I read seven books in April and eleven (some not pictured) in May with one DNF (The Book Thief). None of these were rereads. To Kill a Mockingbird by Harper Lee and Murder on the Orient Express by Agatha Christie were for school. 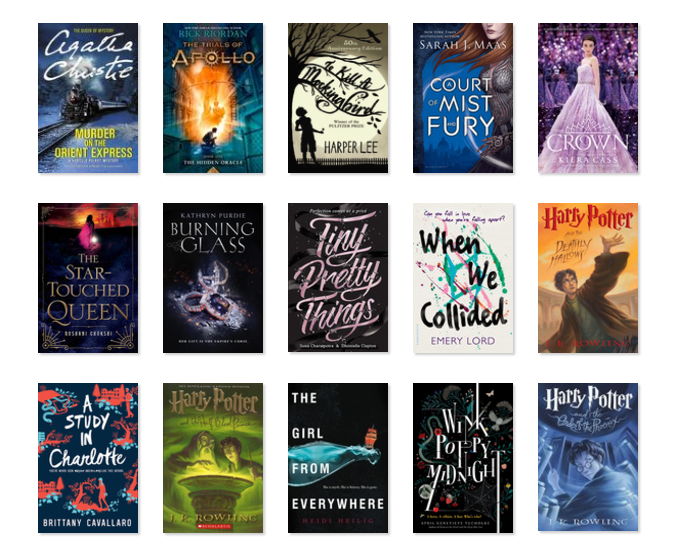 My favorite book in March overall was Harry Potter and the Order of the Phoenix by JK Rowling. My favorite in April was Harry Potter and the Deathly Hallows by JK Rowling and in May it was A Court of Mist and Fury by Sarah J. Maas. I read the first four in May. 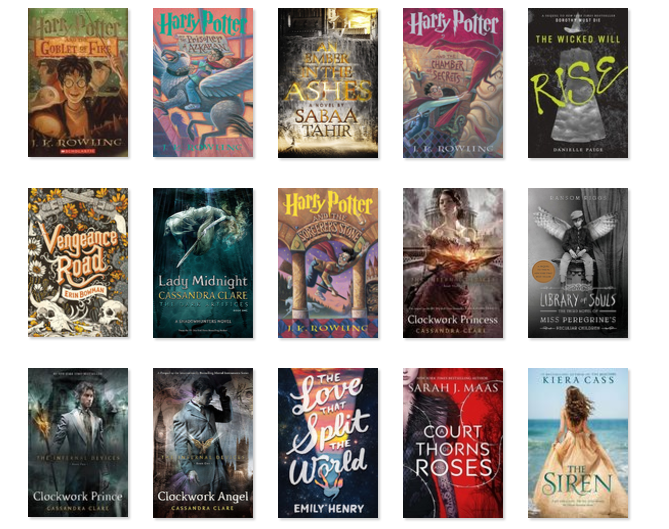 I read fourteen books in all in June! To All the Boys I’ve Loved Before by Jenny Han, Wonder by R.J Palacio, Six of Crows by Leigh Bardugo, and P.S. I Still Love You by Jenny Han were rereads. 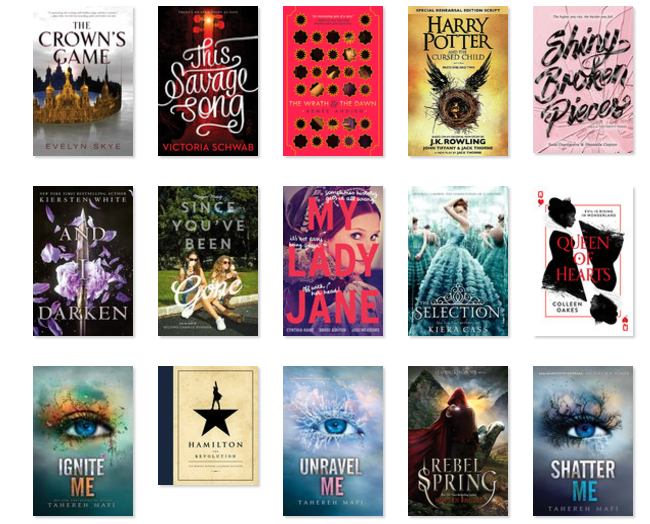 My favorite from this section of May was The Unexpected Everything by Morgan Matson, but A Court of Mist and Fury by Sarah J. Maas was my overall favorite. Six of Crows by Leigh Bardugo was a reread, but still my favorite. I also really enjoyed Scarlett Epstein Hates it Here by Anna Breslaw. The first three of these were read in June while the rest were in July and August. I read eight books overall in July and eight (some not pictured) in August. The only reread was The Selection by Kiera Cass. My favorite book in this portion of June was Rebel Spring by Morgan Rhodes while my July favorite was for sure My Lady Jane by Cynthia Hand, Brodi Ashton, and Jodi Meadows. For August, my favorite was The Wrath and the Dawn by Renee Ahdieh. Four of these pictured were read in August. I read seven books in September, four in October, and four in November (one pictured). How to Read Literature Like a Professor by Thomas C. Foster and the Metamorphosis by Franz Kafka were for school. 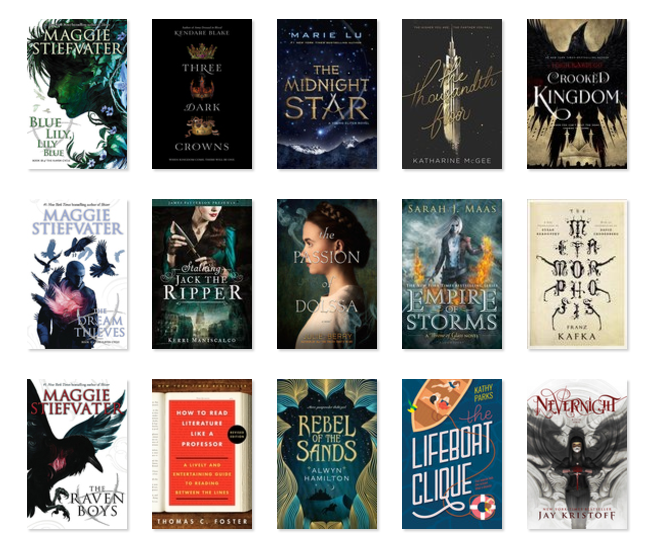 My favorite in September were The Dream Thieves by Maggie Stiefvater, Stalking Jack the Ripper by Kerri Maniscalco, and Empire of Storms by Sarah J. Maas (I can’t just choose one!). My favorite in October was definitely Crooked Kingdom by Leigh Bardugo! Blue Lily, Lily Blue by Maggie Stiefvater was my favorite in November as well. Yipee! I read four books in November and then I read eight in December with one (Ever the Hunted by Erin Summerill) not pictured. Flight Behavior was read for school. My favorite in November was Blue Lily, Lily Blue by Maggie Stiefvater, but I really loved all four books I read that month. For December my favorite was for sure Roseblood by A.G. Howard but Gathering Darkness by Morgan Rhodes and Caraval by Stephanie Garber were close seconds! I can’t believe I actually started this blog this year! I posted my first post on Juny 26, 2016, and I still can’t believe how much this page has grown since. My blog’s not huge, but I definitely never expected it would be doing this well, especially only after about five months. Even in those few months my blog has undergone some major changes as I learned more about blogging. I changed the theme in November to something I’m much happier with. I also started to work on graphics. My graphics went from pretty bad to now actually looking pretty good. I am very happy with my blog right now! It has changed so much. 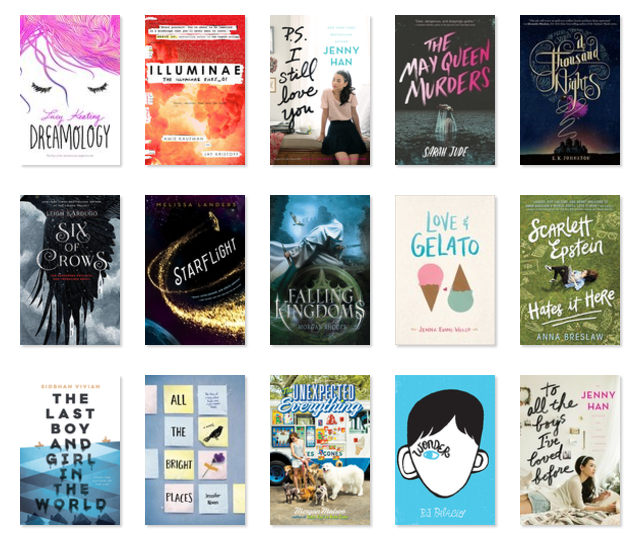 I did a full post on my top fifteen books, but I’ll just share my top five from the past year. Tied for first are Salt to the Sea by Ruta Sepetys and Crooked Kingdom by Leigh Bardugo. A Court of Mist and Fury by Sarah J. Maas is a close second. Harry Potter and the Order of the Phoenix and Lady Midnight came in fourth/fifth. 🙂 I absolutely LOVED all these books! there are so many more, so you’ll have to check out my full post on all my favorites. I actually don’t watch a whole lot of TV, but I discovered and fell in love with Unbreakable kimmy Schmidt, Gilmore Girls, and The Crown this past year! I binge watched all of them on Netflix this year like crazy. My favorite movie released in 2016 was for sure Fantastic Beasts and Where to Find Them! I didn’t really discover many new movies, but I constantly rewatched my favorites. Mean Girls, Napoleon Dynamite, Pitch Perfect, all the Harry Potter movies, and Just Go With It are my favorites! I GOT A CAT! I actually never thought I’d get a cat until I moved out because my dad doesn’t like them, but he finally let me get one. On September 8, 2016, I adopted Miss Mittens the Kitten. A family my aunt knew had found her playing in the park chasing around the ducks all alone, so we rescued her from them. I love my kitten so so much! She’s just the sweetest, but she’s also gotten pretty fat. And she’s VERY fluffy. When we first took her to the vet, they said she could go either way, long hair or short hair. Since then, she’s turned into the fluffiest cat ever. Mittens will lay around all day if she had the option, but she loves playing, too. My family also got a puppy! 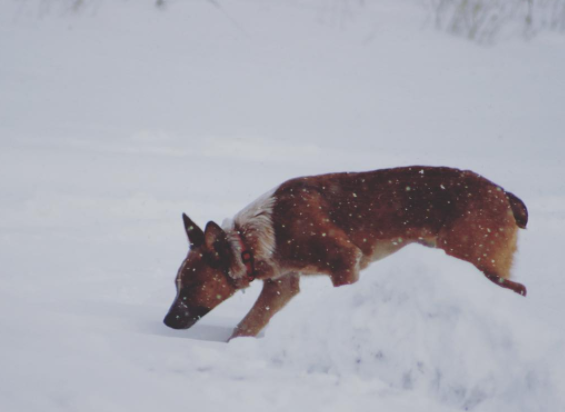 Aussie Bean is an Australian Cattle Dog/Red Heeler. Her name is officially Aussie but we all call her “Aussie Bean”, “Beanie”, or “the Bean” most of the time rather than just Aussie. She’s such a sweet little perfect puppy and she’s very energetic and playful. Whenever she’s around snow she goes crazy, it’s seriously the cutest thing ever watching her hop around in it. I love our Aussie Bean so much. And she’s such a beautiful dog, too. Just look at her! Districtrebxls reached 1k! And then I hit 1.1k and 1.2k! I actually started my bookstagram forever ago but I kind of just did it on and off and I didn’t post regularly. But I started posting more regularly earlier this year. 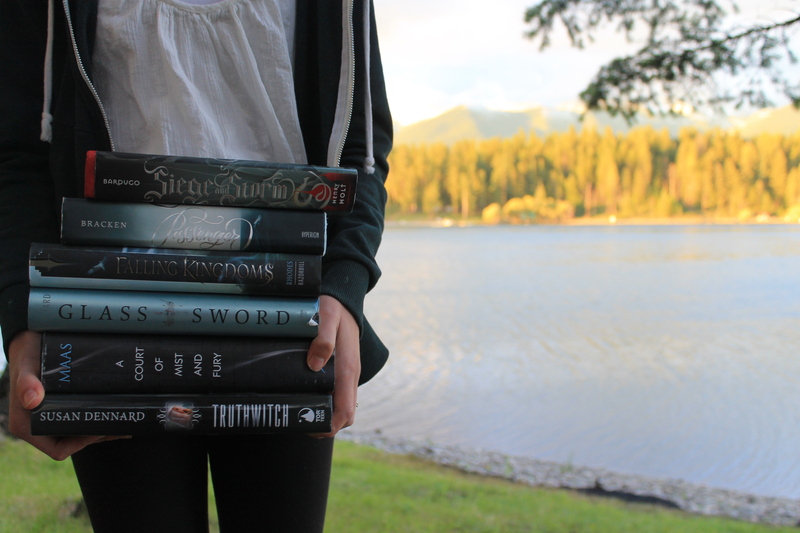 Bookstagram is one of my favorite things ever! It’s wonderful, and it’s a place to meet more and more book lovers. 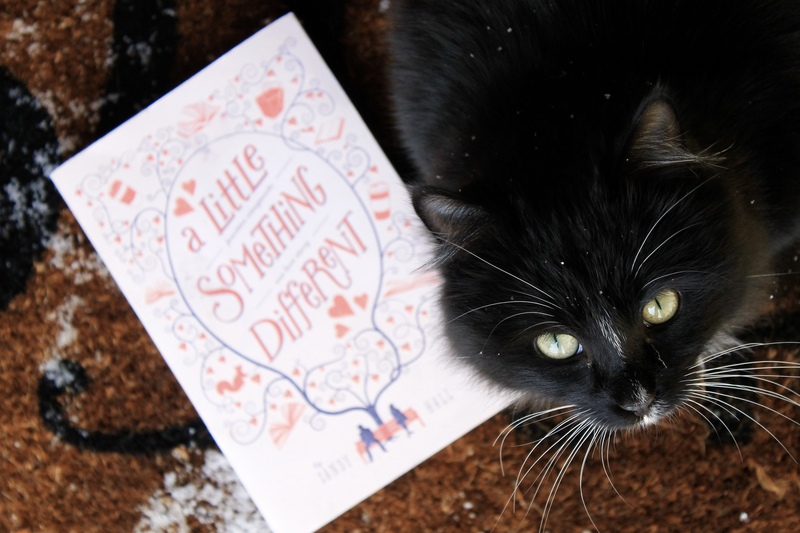 I started with my bookstagram way before my blog, too, while it seems like it’s the other way around for most people. This is a photo of my top nine posts from this year. Also, I did my very first NaNoWriMo and completed it! My novel isn’t even close to being done, but hitting 50k was one of the most amazing feelings in the world. I haven’t done much writing since, but I’m hoping to finish the first draft before next summer. It’s actually really slow (like, too slow), so I already know what I’m going to have to fix in draft two, which is a long ways away. Some other amazing things from this year were meeting Cassandra Clare and Marissa Meyer for Lady Midnight and Stars Above! My family moved (hence why we got a puppy and a kitten!). I bought my own laptop and received my first phone. Also, I found out that I’m going to Europe next summer, which has been one of my dreams ever since I can remember. I got my first pair of pointe shoes in September and have been en pointe since. My Halloween Corpse Bride costume turned out really pretty, and much better than I expected. I shattered my old iPad mini and broke my first pair of glasses (whoops). Luckily, both those problems were fixed. I discovered so many AMAZING books in 2016 and I finally picked up Harry Potter! How many did you read in 2016? What was your favorite? Are you as obsessed as me with cats, too? When did you start your blog? Anything you want to see on Glittering Reads in 2017? Please, let me know in the comments! Oh my :0 I wish I had so much freetime to read so many books. That’s life goals right there! It looks like you had a wonderful year! 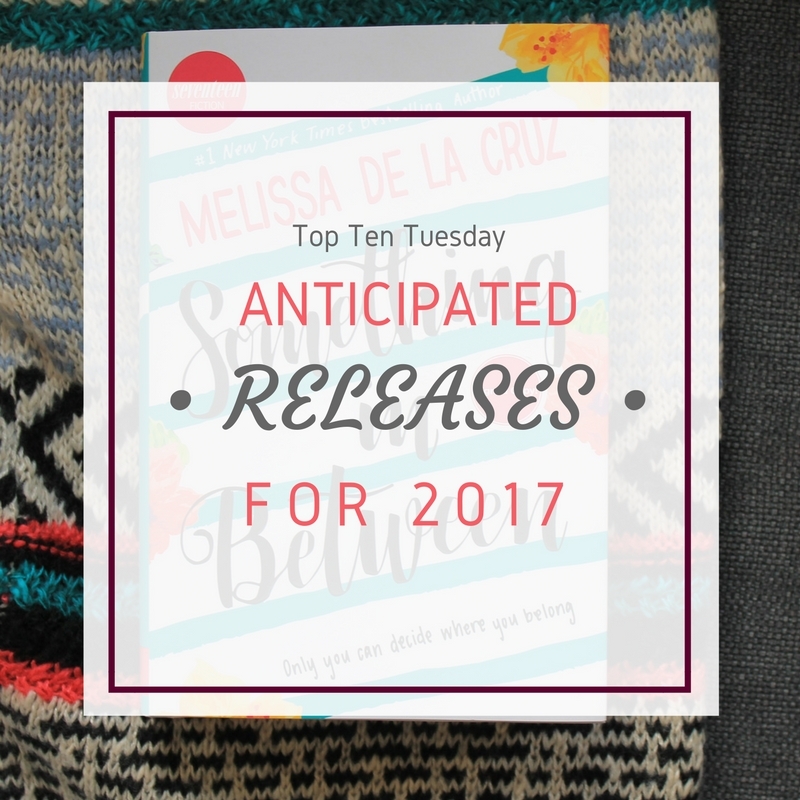 I also adored all of the books on your favorites list for the year, especially Crooked Kingdom and Lady Midnight. Yay for becoming a blogger in 2016! <3 I applied to a co-blogger search at one of the book blogs I'd been following for years on a total whim, and now, six months later, here I am with two wonderful co-bloggers and a new hobby that I love. Your pets are so beautiful! Ooh, I'm so happy you got into musicals this year! I also love Hamilton (duh), She Loves Me, and In the Heights. My all-time favorite musicals are Into the Woods (a classic. literally has everything you could ever want in a musical. Sondheim is a freakin' genius.) and Next to Normal (by far my favorite modern musical. SO IMPORTANT and such wonderful music.). Other recommendations: Waitress, Spring Awakening, Newsies, R&H Cinderella, Carousel. Happy New Year to you too! Best wishes for 2017! Hamilton also introduced me to the world of broadway and musicals in general. Prior to listening to Hamilton I had never really been into musicals before, but now I appreciate and enjoy them so much more! (Also, have you listened to the Hamilton mix tape? PURE GOLD.) My other favorite musical is probably Sweeney Todd– it's gruesome and morbid, but the music is fantastic!! I did, thank you! YES! Getting those two were by far the best parts of the year 😉 Do you have any pets? Before Hamilton, I had actually seen Phantom with my dad, but I never really knew anything about broadway. Now it’s one of my favorite things ever! The Hamilton mixtape was so good! There were a few songs I didn’t like, but I loved most of them. I’ll have to listen to Sweeney Todd, now. 🙂 Happy New Year! Congrats on going over your reading goal! I barely made it over mine. I hope you have an awesome 2017! Also, I’m a huge musical fan. Thank you! My original goal was actually 60 but then I changed it to 70. I had no idea I would ever exceed it by that much though. That’s okay though 🙂 Right? What kind of cat did you get? Happy New Year’s! I NEED to read Lady Midnight! I’ve heard such great things about it. At first, I was waiting for Tales from the Shadowhunter Academy to come out in print because I’ve heard that it’s better to read that one first, but now I still haven’t read that and I don’t know what I’m waiting for. Hopefully I’ll get to it next year! And your cat is SO CUTE! I have a black and white cat, too. Her name is Mozart. As for musicals, I definitely recommend Newsies, A Gentleman’s Guide to Love and Murder, and The Color Purple. I’ve been lucky enough to see all of those on Broadway, and I loved them all. It’s so good! I didn’t know that though. I read the first eBook but decided I might as well wait for the whole thing to come out, so I just bought Tales from the Shadowhunter Academy the other day. Thank you! She’s my baby <3 haha. I have a soft spot for black and white cats now 😉 I've heard The Color Purple is AMAZING, so I'll have to check it out, along with the others. Thanks for the recommendations, Clara! Happy New Year!